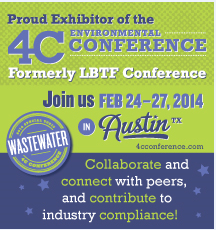 ERA Environmental Management Solutions will be exhibiting our Environmental Management System (EMS) software at the upcoming 4C Environmental Conference in Austin, Texas from February 24 to 27. Every year, the 4C Environmental Conference (formerly known as the LBTF Conference) offers industry professionals advanced training courses on a variety of cutting-edge and current environmental management trends. This year is no exception, with courses on tanks, flares, wastewater, and air permitting. ERA's team will be on hand to talk about our Oil & Gas EMS software that is used by the Oil & Gas industry to help manage and monitor the industry's full spectrum of EH&S concerns, including tank calculations, air emissions, flares, VRUs, wastewater, Alternate Operating Scenarios (AOS), Maintenance Startup & Shutdown events (MSS), and Quad O (Subpart OOOO). ERA software also automates compliance tasks, reporting, and business continuity. For these reasons and more ERA software is already used to manage the performance of thousands of tanks across North America. If you're attending the 4C Conference make sure to come by ERA's booth for a chance to speak with one of our Senior Systems Analysts who will be on hand to discuss your EH&S performance needs. ERA's team will be at Booth 23, near by the main escalators - make sure you come by and say hello. ERA is looking forward to meeting with all of our colleagues in the Oil & Gas sector and for the chance to share our experience in helping businesses stay in compliance while improving the efficiency of their EH&S operations.